ENJOY THE GREAT OUTDOORS AND IMPROVE THE BEAUTY OF YOUR COMMUNITY AT THE SAME TIME! You or your civic group, church, or school can make a direct contribution to our community and our County parks by adopting a portion of a trail or park within the El Paso County parks system. All it takes is some caring, time, and a little effort. 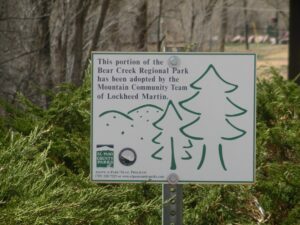 Groups and individuals can participate by visiting the adopted site at least twice a year to pick up trash, look for signs of vandalism, and report any problems. Special work projects may include flower or tree planting, repairing trails or other projects as developed in collaboration with the Parks Supervisor. time and talent for the purpose of enriching their County Regional Parks and Trails. beautification of El Paso County’s Regional Parks and Trails. • Increase awareness of County parks and trails. • Encourage and recognize volunteer contributions and efforts. • The program is available to any organized group located in El Paso County. year – Spring & Fall. for the period April to October each year and thereafter as weather permits. • Volunteers shall provide services for a minimum period of one year. • An adult must supervise groups with members under the age of 18.
important tool to evaluate facilities and document volunteer contributions to the El Paso County park system. to accomplish the requirements of the program. • Volunteer groups shall agree to abide by County park regulations. the liaison with the Community Outreach Coordinator. work dates, and ensuring compliance with the Agreement. areas are subject to availability and may be closed for safety reasons. planting flowers, building benches and repairing trails. equipment, interpretive displays, videos and books. 2. One sign posted at the adopted area acknowledging the adoption. 3. One free pavilion rental each calendar year. to notify of where the trash collection bags can be retrieved.